Pictured (left to right): Thanh Dang, Kyle Lawrence, Rich Harris, Suzi Carter, Rhonda Cooper, and Mike Dalmolin. 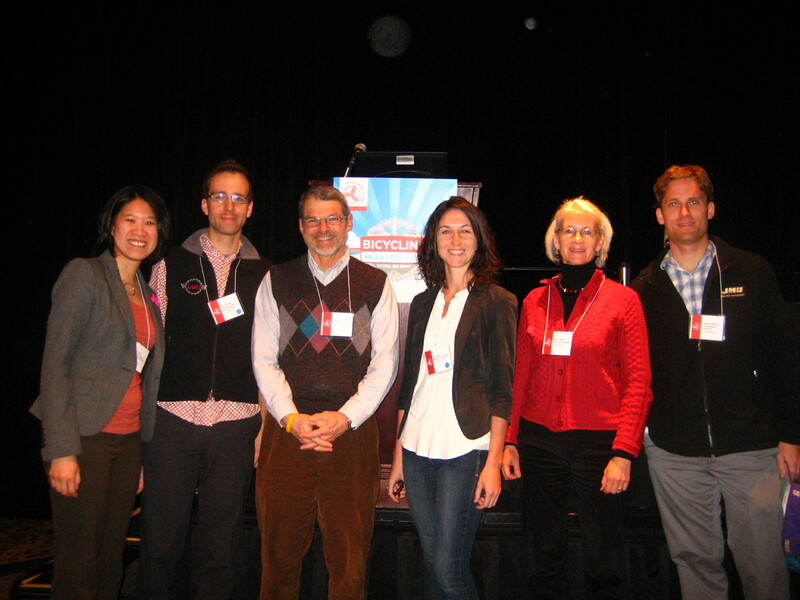 What a great time at the 2013 National Bike Summit. As covered in a previous post Harrisonburg was very well represented this year at the Summit. Six of us traveled from Harrisonburg and Rockingham Co. to Washington, DC to join 750 other bicyclists and “urbanists” representing all 50 states and a few others from Canada to discuss, inspire, and share ideas on how to build healthier, more bikable and walkable communities. U.S. Secretary of Transportation Ray LaHood was the keynote speaker, and plenary speakers included NYC Transportation Commissioner Janette Sadik-Khan, President of Trek Bicycles Inc. John Burke, and Vice President of the Brookings Institute Bruce Katz. One of my favorite presentations from the Summit this year was by Veronica Davis, co-founder of Black Women Bike DC. She and her friend started this bike club in Washington, DC to expose more African-American women to bicycling. What she shared about how they are doing it, the principals of making biking more accessible, more everyday, socialable and fun, more visible, and how to talk about bicycling with others unfamiliar with biking can be applied to all groups and sub-groups of people. Check out her presentation in the video below (or click here). The theme for this year’s Summit was “Bicycling Means Business”. Mayor Greg Ballard (R) of Indianapolis spoke about how bike lanes and bike paths have attracted young people to his city, and spoke about the new Cultural Trail and how biking has brought positive economic impacts to his city. 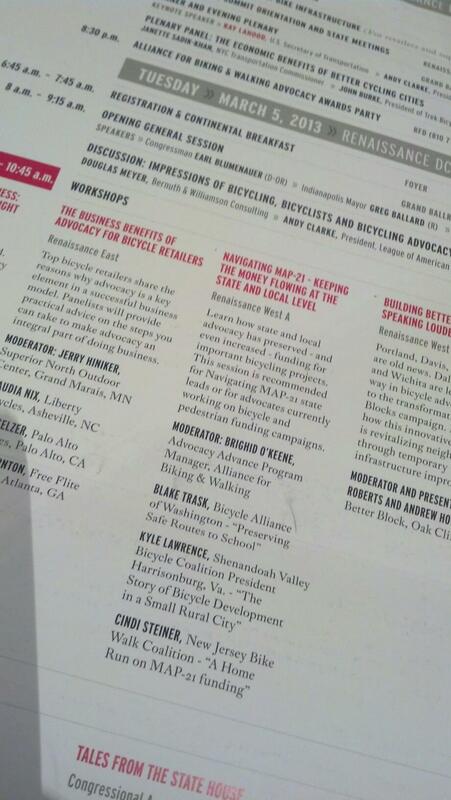 I also enjoyed the workshop “Bicycling Means Business: Helping Developers Meet the Triple Bottom Line”. There, Wendy Durren of Arlington Transportation Partners shared how Arlington County, VA was helping developers, employers, and property managers improve their transportation amenities and benefits using transportation demand management strategies. Summit organizers were also very interested what’s been going on and the successes in Harrisonburg and Rockingham County! Kyle Lawrence, SVBC Board President, was invited to present at one of the workshops. He presented “The Story of Bicycle Development in a Small Rural City.” He shared the value of Shenandoah Valley Bicycle Coalition members as advocates and the work that they do in our community, how SVBC co-sponsored a group of citizen and city of Harrisonburg staff and officials on a trip to Davis, California in 2010, how City Council appropriated $1.2 million last year to the Northend Greenway and the Bluestone Trail projects, and discussed the great value of partnerships between SVBC, the Northend Greenway, James Madison University, City of Harrisonburg, and Rockingham County. Thanh Dang, Public Works Planner at City of Harrisonburg, on the impact of the Advocacy Advance workshop in gaining funding support for local improvements. Mike, Rich, Rhonda, and Thanh (not pictured) explored the beautiful Mt. Vernon Trail. 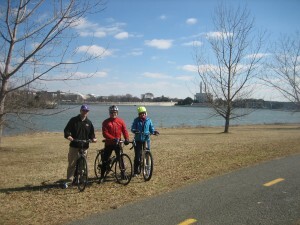 Behind them is the Potomac River and Washington, DC. Thank you SVBC for the opportunity to attend the National Bike Summit. Thanh Dang is Public Works Planner at the City of Harrisonburg where she manages bicycle and pedestrian projects among “other duties as assigned”. She is also a League Certified Instructor and will be teaching a Confident City Cycling class in Harrisonburg later this Spring, and is a member of SVBC. MISS THE SUMMIT? VIDEOS NOW ONLINE! If you didn’t make the trip to Washington, D.C., click through our YouTube channel for videos from the Bike Summit and the Women’s Forum. Keep a lookout for more video uploads from the Summit and slides from many of the presentations on the Summit webpage. Thanh, what an awesome post! Thank you so much for sharing this with us–it sounds like such a cool experience. I’m so proud that SVBC spends its money (our money!) so wisely!! Thanks for representing us in our nation’s capital. I enjoyed your report with the details.